where can you find... restaurants near 101 to watch Taipei New Year's Eve fireworks afterwards? Wherever you are celebrating New Year's Eve, whether it's with the hordes of people in drizzling rain near the 101 Fireworks in Taipei, listening to Mayday, Wang Lee Hom and SHE in front of Taipei City Hall tonight, or celebrating at home with family and friends in front of the TV, have a happy and healthy new year! I can't believe it's going to be 2010! If you are looking for last minute place for dinner for Taipei's New Years Eve in the 101 area, you can browse the this label. Everything will probably be packed and crazy, but it's worth a shot if you want to party it up. Keep in mind, there will be a ton of street vendors out tonight though so you can nosh your way through the night too. And of course, you don't have to be in the immediate area to see the fireworks, you can have a great view from across the river in Dazhi or Miramar too. Here are the eateries in the 101 area off the top of my head- you can search the name in the upper left hand box for the review/number. I'm curious if any of you readers are eating out here tonight and if so, what are the crowds/wait like? When a friend asked me if I wanted to make Christmas cookies together, I jumped at the chance. I always wanted to, but never was motivated enough to do it. She made the dough the night before, I had the oven/baking supplies and the sprinkles/icing (from LA) and we both had a mini-spree to get cookie cutters from CitySuper, so we were all set. She wasn't able to find shortening, so she just substituted butter, but it made the dough quite soft. Despite being in the fridge overnight, our dough would get too soft to work with. So we stuck the batch in the freezer when we weren't working with it, which made it nice and firm to roll out and cut cleanly to decorate and put on the tray. I loved this icing from LA which made it super easy to decorate. Why can't we find this stuff in Taipei- or can my baking readers divulge where the stash is in this city? If you're having trouble finding sprinkles, you can order the ones I have - Wilton 6 Color Christmas Sprinkle Mix from Amazon.com. It's an awesome combo that you can use for eyes/buttons, general sprinkling. Mmmm, cookies baking in the oven are awesome and it's actually my first time making Christmas cookies! 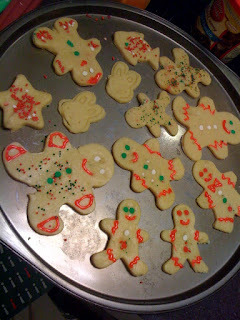 (Not counting the time that I _watched_ my friend L make a ton of different amazing Christmas cookies in high school). Here are a few of the cute ones, packaged up and ready to be eaten by friends. VVG Table still offers a weekend bento-ish brunch for those who are tired of plain old eggs and pancakes. Instead- you get grilled pork over couscous, a soft boiled egg, a crepe and baked half pear stuffed with cherries. Not to mention the latte in a bowl and cinnamon red wine and the huge grape/berry juice. It's different every time I come, so it's sort of a surprise each time. One thing that has stayed the same is the starter- be sure to try all the different sauces and breads- nutella, honey, marmalade and fruit preserves. I have witnessed the nutella spoon being licked, but luckily not on this visit. We were advised to eat the soft boiled egg first, and how I do like a soft boiled egg. I was pretty excited to have couscous, but not excited to see raisins and have to pick them out. Ugh. Everything tasted lovely as usual- delicate and with finesse. If only brunch at VVG Table weren't so dang expensive- (about NT$500-600) I could eat here more often. But despite the price, the eclectic space is full of people, some others also armed with cameras. If you don't get a seat without a reservation, you can try VVG or VVG Bon Bon. I had a fun tweet up with two new friends. Perhaps we'll brunch again soon. My first visit to Taj has been long overdue. I had tried to eat there on a few occasions. Once I stopped by with some friends, but it turned out they were closed. Then another time, but they were not open until noon and we were ready to eat at 11am. So when I was in the neighborhood with my friend V deciding on where to eat a few weeks ago, I thought we could finally give Taj a try. It's in the alley behind Zhong Xiao E. Road, not too far from the Dun Hua Eslite or San Want Hotel. 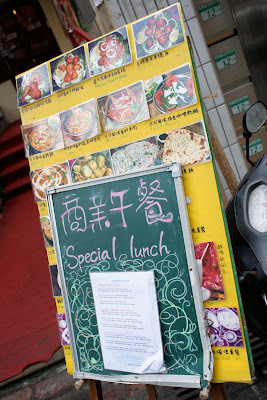 Once you find it, you can browse the specials on their sign outside. 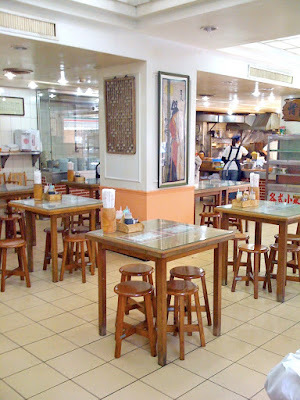 The English and Chinese menu is full of pictures and has a range of appetizers, curries and tandoor items. But while browsing the menu in detail, a lot of things that I've grown to love were crossed out or unavailable- eggplant curry, okra curry, mango lassi. There's also a few lunch sets available (NT$150-$250), which come with yoghurt, sago ki kheer and choice of naan or rice. The space is roomy with some decorative elements with some touches that could make it a nice date night place. While it would be easier (and more cost efficient) to order a set lunch when dining alone, I had the chance to try both the ala carte curry and the set curry and it was a world of difference. If I could make a suggestion- don't order the lunch set curry- it curry was more watery and the meat seemed tougher/smaller cuts. Between the four of us friends, the ala carte curry was finished, but the chicken and mutton curries sat and no one wanted to take them home afterwards. It's too bad they don't make a more equal quality of curry to match their regular offerings, but I guess they can't at that price point? Instead opt for their hearty tandoori chicken which came with decent sized pieces and was perfectly grilled. The garlic naan was fantastic and one of the best parts of the meal. Hot, chewy and garlicky. While I mentioned to the waiter I usually favored chicken tikka masala, he suggested the butter chicken. While the curry had a nice creamy, spicy flavor and tender chunks of chicken, I still missed the slight sweetness of the tikka masala. My friend who came a little later added a spinach curry to our order. I was surprised (and not happy) to taste a strong bitterness in the spices that were used for the spinach curry. I couldn't handle it and had never tasted anything like that before in other Indian spinach curries I've tasted, but my friend was okay with it. The samosas were also disappointing. While crunchy on the outside, they were quite dry on the inside, which intensified the spiciness. Combined with the also dry skin of the samosa, I wouldn't order it again. I was bummed I didn't have a better overall experience at Taj. Have any readers been before- and what did you order? I might go back and try the flavors of some of the other curries, like my standby chicken tikka masala, but I was hoping that I'd discover something new to have love-at-first-taste with. 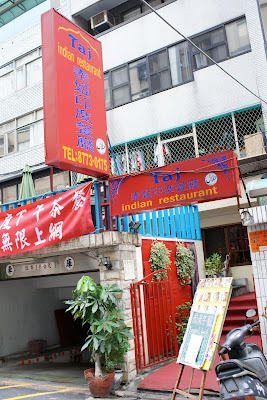 I really wanted to find a closer go-to Indian restaurant in the DaAn or Xinyi district since my other experiences have been inconsistent, or the restaurants that have been great, like Saffron, are too far away. For now, I'll just have to settle for fast food mall joint Indian Palace. I think for this post, I'm going to let the pizzas, I mean the pictures do the talking. Thanks to reader Gil for giving me the heads up on this tucked away new pizzeria, just opened in October. 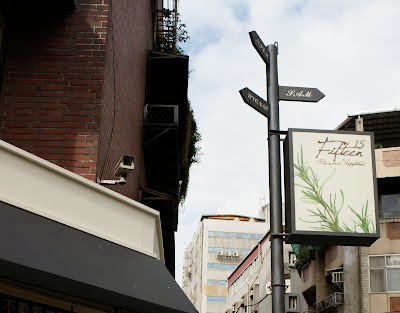 It's actually on the same alley as my favorite Shan Xi Dao Xiao Mian place, near the Heping and Fuxing intersection. Why the name Fifteen? Apparently, they are Jamie Oliver fans and the name is a bit of an homage to that (it's the name of his restaurant in London). And if you sit at one of their barstool seats, you'll have a front row seat to some pizza making action just as if you were watching your favorite Food Networks show. Travel and Living show for those of you in Taipei. Fresh pizza dough gets flattened and topped with selections like prosciutto and arugula, clams and garlic or pesto and mushrooms, and of course mozzarella and parmasan cheese. After being baked in the stone brick oven, the pizzas come to our table surprisingly quickly. The space is not large, but has a few window-side tables as well as tables outside which look right out to the adjacent park. It doesn't seem tableready for groups larger than 4, which is too bad because their pizzas are the perfect kind to order a few different kinds to share. The menu right now only has pizzas and a soup of the day (despite the first page of the menu having appetizers), but there are a range of gourmet toppings you can choose from. From the traditional mozzarella and basil to the more unusual include Pizza Cavolfiore (cauliflower), Pizza Patata (sliced roasted potato) or Pizza Fiorentina (spinach, bacon, eggs) in the NT$300 plus range. 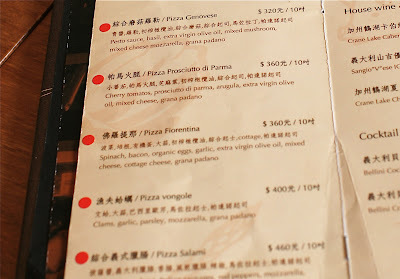 The prices on the menu are for the 10 inch, but ordering the 8 inch saves you NT$60/pizza. We got the Pizza Portobello Mushroom (NT$260 for 8") which chose because it had pizza sauce (only the ones listed with having sauce have sauce, otherwise, they just come with cheese and toppings) which definitely on the light side. But the toppings were fresh and plentiful and the mushrooms retained a juicy flavor. The pizza was dusted with a tad too much salt as the prosciutto is already cured, but alternating a bite with the springy crust took care of it. The prosciutto was velvety and softened a bit with the heat of the pizza. My friend and I had intended to just have a bit of each and save the leftovers for other friends, but we ended up eating almost the entirety of the two 8 inch pizzas between us. The crusts are soft and chewy and while the base of pizza is thin, it's not crispy, like you'd find at Alleycats. 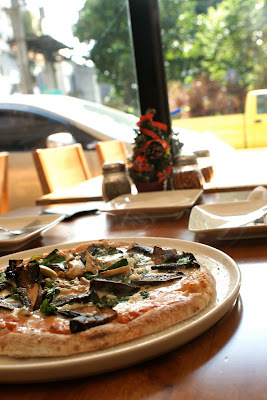 The pizza reminds me of Primo Trattoria, especially with the Fiorentina being available at both places, but Fifteen seems like a more casual and cozy hangout. Stuffed and happy, I got a Pizza Genovese to-go, which has pesto sauce, mixed mushrooms and basil. I discovered that to-go pizzas get an additional 20 percent off, which is perfect because it saves you the sit-in 10% service fee and then you save a little extra. Definitely give Fifteen Pizza a try- it is a bit unusual in that alley of Chinese eateries, and they said business has been so-so after their strong opening. I only wish it was a bit closer to my neighborhood, but it will give me an excuse to wander in that direction. Don't forget to vote for your favorite restaurants in the BEST OF TAIPEI READERS' CHOICE POLL!! Only a few weeks to go and I need y'all to chip in! I know there are more of you out there itching to vote for your favorite restaurants in Taipei! Don't hold out on me! If you've ever found last year's Best of Taipei list useful, or my blog, please do share a few of your favorites so it's not just people I know! Even if you've only visited, it's great to know what you loved and where you would eat at again. Also, I'm in the running for Taiwan Best Blog Awards. If I've helped you find a new place (or three) to eat, or you enjoy drooling over stinky tofu or shaved ice from afar, please take 5 seconds to vote for my blog by clicking on the plus sign.Voting is allowed once every 24 hours from the same computer. The beauty and simplicity of the Chinese breakfast- a steaming hot bowl of soy milk and a fried you tiao to dip in- joins classic combinations like Oreos and milk, coffee and donuts, or eggnog and, uh, Christmas cookies? Haha, you got me on that one. I'm sure there's more, like steamed buns, but those are the basics. 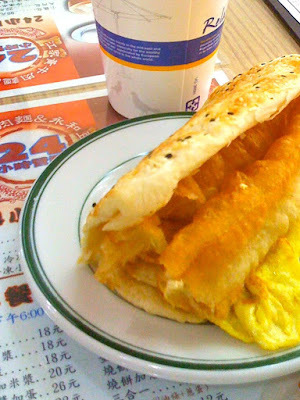 So all around Taipei, there are a bunch of Chinese breakfast places, some holier-in-the-wall than others. Maybe you've heard of a famous "Yong He Dou Jiang" or seen one near your house. But actually they are not all related to each other. As I understand, there is a really famous and delicious soy milk place in YongHe, but it's not even called Yong He Dou Jiang! But because of its popularity, a bunch of places sprung up with that as their name or part of their name as a marketing tactic. if you're looking for one to try, you can check out the one near SYS Memorial Hall, just around the corner from the MRT stop. 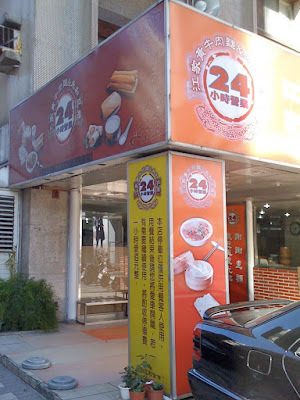 The signs say it's 24 hours, with certain things available 24 hours (xiao long bao), some available only until 11am, others only after 11am (beef noodle soup). The perfect place to eat breakfast if you want to eat some xiao long bao and soy milk after getting in from an early flight, or after a long, late night of meetings. The space is weathered, but clean and spacious, with seating on wooden stools. Menus under the glass and sauces are on every table. The prices are so good, you could make your own little breakfast buffet. Or you can grab and go. The fried you tiao sticks here are best eaten hot, dipped in the warm soy milk, as they aren't as crispy I'd love. The first time I go, I get the shao bing you tiao which is a bit messy to eat, with the flaky pastry crumbs leaving evidence everywhere. The sticky rice roll is dense and a bit heavy for breakfast, but good if you are hungry. 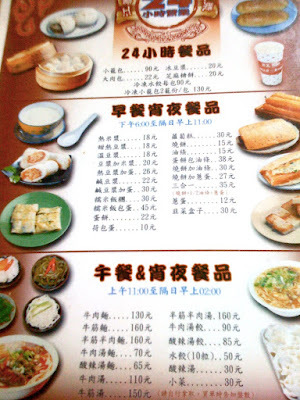 But my favorite here is the xian dou jiang or salty soy milk. 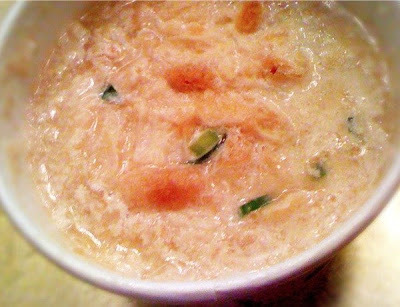 Growing up in LA, I remember weekends to our local Chinese restaurant- my mom ordering sweet dou jiang which looked like a bowl of hot milk, and my dad ordering salty, which looked like something no kid wants to eat. Imagine curdled milk, which is sort of what it is- vinegar added to soy milk to create congealed bits of liquid-y tofu. That image of salty soy milk was so strong that I never wanted to try it until recently (two months ago). And I fell in love with it! It tasted like a hot breakfast tofu stew, with salty pickled vegetable bits and bite sized pieces of you tiao mixed in. I don't know what spurred the decision- maybe because everyone seemed to be heartily slurping their up, maybe because over the years eating soondubu and drinking cold sweet soy milk (also a recent thing) warmed me up to its potential. So if you've never tried the typical Chinese breakfast, give it a try instead of your usual milk and cereal or McD's mcmuffin. If you're a longtime fan, you have to share where is the best place to get it. Ice Monster on Yong Kang Street is known for its huge mango shaved ice, but when mango is out of season, their other shaved ice options are just as great. Many Taipei local shaved ice places shut down for winter, but Ice Monster still has a packed house on a weekday December afternoon, indicating I'm not alone in wanting a cold dessert on a cool day. Established in 1995, Ice Monster was the inventor of mango ice, a genius combination of fresh mango cubes, shaved ice and condensed milk, which has been has been copied around the world. During the summer months, there is often a long line and wait for seats in the small seating area. Their self explanatory picture menu indicates that mango ice is indeed "out of season," but my out of town friends are just fine with the fresh fruit mix shaved ice (NT$160) with kiwi, strawberries and mango jelly (although they used to do it with fresh cubed mango?!! ), topped with a huge scoop of mango ice cream, which is what's usually available during the winter season. They also have smoothies, sorbet flavors like passion fruit, strawberry milk, mandarin orange, and shaved ice topped with sweet potato, red bean or rock mochi. Or you can opt for hot options like red bean or peanut soup. We also try the caramel jelly and custard shaved ice (NT$160), which is surprisingly great. The milky custard, QQ caramel jelly and brown sugar laden shaved ice tastes like a I'm eating a deconstructed Caramel Frappuccino. Mmmmm. I actually like this better than the mango ice, which somehow seems like more of a sugary overload. While more expensive than most other shaved ice places in town, Ice Monster has become a landmark for mango shaved ice and with their huge portions, a shaved ice is enough to share between 2 or 3 people. Unless you want to keep one all to yourself. Can you believe Ice Monster was my very first review on this blog almost 4 and half years ago?! To everyone who's been following along my food adventures, thanks for reading and eating with me.